Summary: A boy and a girl ask each other, “What do you want to play?” Unfortunately, neither one has an answer the other one likes. The boy wants to a dinosaur or a dragon or a race car driver; the girl a magical wizard or a ballet instructor or queen of the universe. 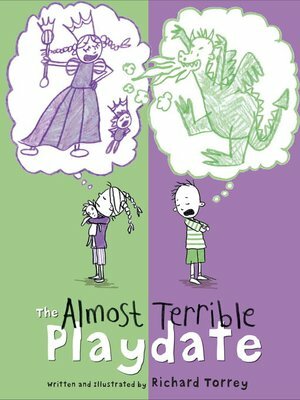 As each one makes a suggestion, the other one’s imagined interpretation of the idea is shown in a crayon cartoon bubble, purple for the girl and green for the boy. Finally, unable to agree on anything, they go their separate ways. Each one starts creating with blocks, but is unable to keep from looking at what the other is doing. Finally, they break down and tell what they’re making; this inspires them to make up a game that includes both creations, and by the end of the playdate, they’re ready to make plans to get together another time. 40 pages; ages 3-7. Pros: A good lesson on the art of compromise. Kids will enjoy the illustrations of what the two characters are thinking. Cons: The ideas for games were a little gender stereotypical.